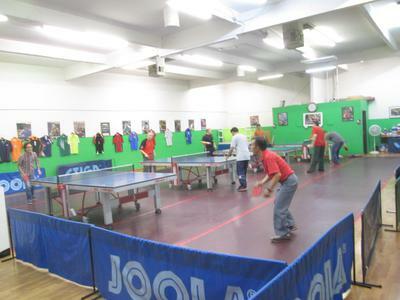 Nevada Table Tennis Club is at 4069 Renate Drive, Las Vegas, Nevada, USA. It is located in the center of Chinatown, about a mile from the Strip. We are open 7 days a week from 10am to 10pm. Call us at 702 876 9717. A lot of transient visitors come here to unwind after spending hours at the casinos. There are restaurants and shopping stores just walking distance from us. We have about 100 members and it could get crowded after 5 pm. We have 4 top of the line tables, very good lighting and red rubber mat flooring. Mr Jong Lee who owns the club gives coaching for $35 an hour. Our walk in fee is $5. Newcomers are very welcome and all our players are very friendly. We also have a robot with a unique ball recycling system. We have a great selection of table tennis equipment and apparel. We have 'The Worlds Best Ball Picker Upper' that was invented here in our club. Our members are friendly and eager to help anybody who wants to get to the next level. So, next time you come to Las Vegas, just come over and play with us. 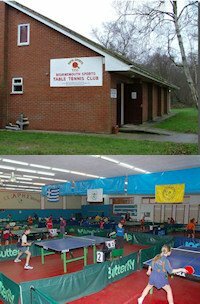 Our club used to be called Olympic TTC but we have to drop it because the word 'Olympic' is copyrighted.